From their first strides as featured guests in yesterday’s boys and girls open races, the ten young athletes from Kenya, some practically novices in terms of competitive experience, gave credence to Murdock’s impression. It was not only their total dominance of both events, leaving some very fine American teens far back, but their furious racing style combined with a child-like innocence suggesting a new template for high school distance running success. This startling athletic dichotomy—a playful persona with running maturity beyond one’s years--was not new to the Kenyans themselves. Watch the Kenyan junior teams at any world cross-country meet. But for American eyes and ears these seemingly sheltered kids, who made a 24-hour journey from Nairobi on Tuesday, carried themselves with the unassuming panache of the future world champions they hope to become. In fact, both Kenyan winners, 15-year-old Leonida Mosop, a sophomore, and 16-year-old Paul Lonyangata, a freshman, said they would compete in the Kenyan cross-country nationals in February to try and earn junior squad berths in the 2007 world meet, to be held in Mombassa, Kenya in late March. The two youngsters had much in common. Both Mosop, who attends Kapkenda High, and Lonyangata, from Moi Sirgoi—schools in the Rift Valley town of Eldoret, teeming with great runners--have been training a couple of years and began competing only last year. This was the first victory for each. And what victories they were: in a Kenyan sweep of the first four places, Mosop led her teammates across the line in 18:35 for the ultra-slow, mud-streamed 5,000 meters; Lonyangata ran 15:54 as his Kenyan quintet swept the first five places with a 41-second spread. By comparison—and such comparisons are inevitable—the U.S. championships went in 19:19, for Ashley Higginson of Colts Neck High in New Jersey, and 16:26 for Murdock, whose opinion of the Kenyans probably was, if anything, affirmed. Mosop, elf-like with wary eyes as she confronted a new world of microphones and hullabaloo, and Lonyangata, all dimpled smiles as he reached out to shake the hands of any runner past the chutes, both said they hoped to eventually become professionals. It was not hubris but need that drove them. Their families subsist on farms. They sell crops like maize, wheat and potatoes. They herd sheep and goats. “I would like to help my parents,” said Mosop. The Kenyans, who train 50 to 70 kilometers a week, doing pyramid intervals from 1,000 down to 100 meters, took the hills, the haybales, the mud, the sections of pond-like water, in full flight. Mosop said she’d not run in mud like this before. “The mud is very hard on you,” she said. This was Mosop’s first season of cross-country, her third cross-country race. 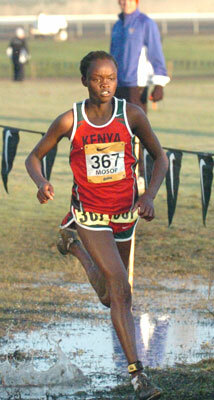 Last season in track, she placed 3rd in the Kenyan national high school track meet, in the 10,000 meters. She could not recall her time exactly but said it was between 33 and 34 minutes. “I’d like to be the best runner in my country,” she said. Seeing Gordon’s exhuberance, Tergat approached her and congratulated her, saying, “You must come to Kenya.” He meant it. You can tell Gordon was thinking about it. The Kenyan boys came next, picking up the pace, adding to the legend. While Tergat’s cousin on the team, Jonah Tergat, did most of the talking for the group in the days before, saying he hoped to finish first, it was Lonyangata, 5’7” and 110 pounds, who strode the course out front with elan. Bathed in mud from head to toe afterwards, Lonyangata said the conditions were “hard, but not too hard.” He was just learning cross-country. 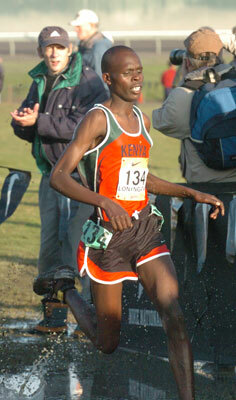 Last June, on the track in Nairobi, he placed sixth in a 5,000 meters, running 13:52. Asked about his earnest efforts on a tough day, Lonyangata said he was “envisioning himself psychologically.” That’s how team organizer Martin Keino explained Lonyangata’s remarks. It was Keino, a son of Kip Keino and former world-class runner, who organized the Kenyan team after Nike invited two high school squads to come to NTN as guests.